BBQ Concepts developed this introduction to the outdoor kitchen design & construction process to help you understand just what to expect from a custom build. There’s quite a few options when it comes to aesthetics as well as overall functionality & performance. From concept to completion, we’ll walk you through the steps necessary to get what you want out of a custom outdoor kitchen build. BBQ Concepts of Las Vegas, Nevada is your premiere outdoor kitchen manufacturer. We make it easy and affordable to both design and build the outdoor living area you’ve always dreamt about. If your new to outdoor kitchens, this is the perfect place to start. We aim to educate and inform you through the entire construction process, every step of the way. Please continue reading this introduction to familiarize yourself with the BBQ Concepts outdoor kitchen design & construction process. Schedule An Outdoor Kitchen Design Consultation Now! When considering your outdoor living area design, you’ll want to think about a few things prior to designing & building it. The nice thing about using BBQ Concepts for your outdoor kitchen design is that you’ll have a professional design consultant guiding you through the process. Half the battle is knowing what’s available to you. To get what you want, we must first understand what you want to achieve. Below you’ll find a few concept questions that might help you understand what you want a little bit better. What area of your backyard would you like the BBQ island built-in? We recommend having one of our BBQ Concepts representatives there with you when you make this decision. We’ll help you pick out the perfect place as well as an amazing layout configuration. We take into consideration many factors during this process. Call now to setup an outdoor kitchen design consultation with us – (702) 872-BBQS (2277). Will you be hosting parties, or the occasional intimate family gathering? Will you need refrigeration, natural gas, or running water? Do you have the existing water and/or gas lines and plumbing needed? Will you need to hire a plumber to run the proper lines? Have you inquired about an estimate? If not, we can help set you up with a great plumbing service here in the valley. What type of fuel will your primary grill & cooking components use? Natural Gas, Propane, Charcoal, Wood, or some other type of hybrid fuel component? Do you plan to dine outside? If so, have you considered a bar top or dining area built-in to the outdoor kitchen. What style of cooking are you interested in? Grilling, Baking, Smoking or a combination of cooking styles? This will help us understand which components to include in you BBQ island design. What type of layout or island shape do you prefer? In other words, what physical shape do you like? What type of finishing materials do you want to use on your outdoor kitchen? Dekton, Granite, Marble, Stacked Stone, Stucco, Tile or any other beautiful aesthetic finishes that are available. Our BBQ Concepts representatives will showcase a huge assortment of available materials. Have you considered functional storage and trash receptacle components? We have a wide variety of stainless-steel outdoor kitchen components. BBQ Concepts is one of Las Vegas, Nevada’s leading professional grill & outdoor kitchen component retailers. We literally have it all. Professional brands like Lynx, Summerset, Alfresco, DCS, Blaze, Bonfire, FireMagic, and so many more. 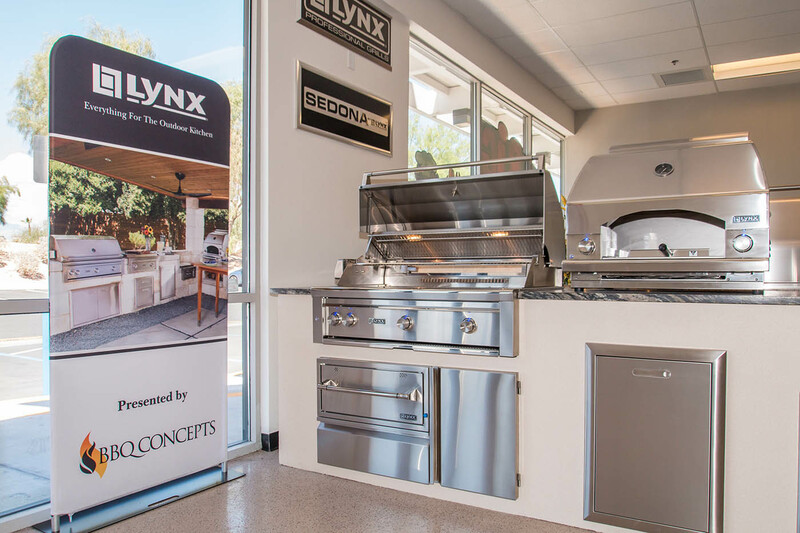 We’re your local outdoor kitchen superstore! What’s your overall project budget? This segment pertains to the overall layout and shape of your outdoor kitchen island. Custom outdoor kitchens can be as simple or as complex as you want. It’s always a great idea to consult with a professional before committing to a particular design. Our professionals are trained and experienced in BBQ island design, we’ll help you come up with a layout configuration that truly compliments your beautiful backyard. BBQ Concepts uses the latest in 3D CAD technology. We’re able to show you conceptual ideas of our proposed design, all before we ever start the construction process. We’re here to help you realize your outdoor living dreams. There are many other considerations to take into account when designing your custom outdoor kitchen area. Things like the sunset, wind, and where your gas and water valves are located. These are topics that we fully address during our on-site design consultation. The best part of designing your custom barbecue island is the level of customization that you have. From professional grills to authentic outdoor pizza ovens, you can truly customize your outdoor kitchen however you like. BBQ Islands are customized with everything from backsplashes, raised bar areas (split level), dining areas, even fire features that are built right in to island. We also specialize in stand-alone water & fire features as well. The options you have are endless, only limited by your imagination. Give us a call today to schedule an on-site design consult.